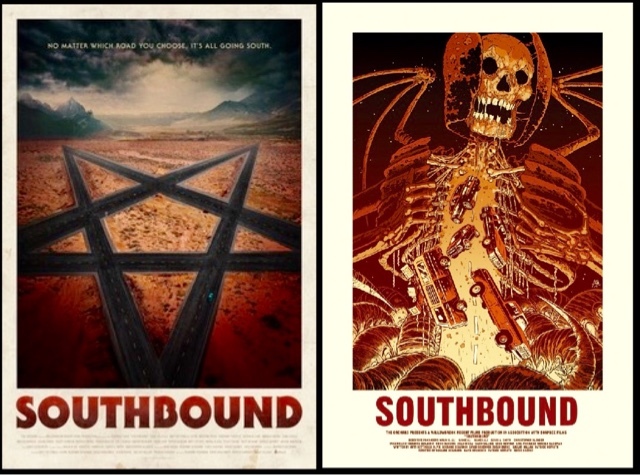 Southbound (2016) Film Review. Production company Willowbrook RegentFilms, distributed by The Orchard US, StudioCanal UK. Directed by RadioSilence,Roxanne Benjemin,David Bruckner,Patrick Horvath. Rated R USCertificate 18 UK. Running time 89 minutes. Southbound above is both the US and European poster of this great film,other anthology movie,with five stories that are written by five different writers and directors,that actually seamlessly runs in one story,and this is what makes this movie so good,although like most anthology movies the separate stories fills us with more questions than answers,this is what makes this anthology so clever. 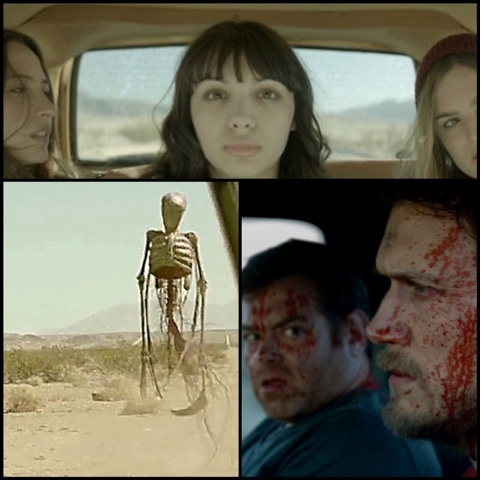 The clues are in this movie between segments,and like films like the great Triangle,and Memento two films that are confusing as hell,but actually improve on every new viewing this film Southbound is is the same. My only clue to this great movie is to watch the final segment first,the rest of the film then will fall into place. I'm not going to do a full run down of every story,as I feel this is a film you all need to watch for yourselves,but I will give the titles and writers and directors of each segment. The Way Out written by Matt Bettinelli-Olpin, Directed by Radio Silence, starring Chad Villella (Mitch) Matt Bettinelli-Olpin (Jack). Siren, written by Roxanne Benjemin and Susan Burke,directed by Roxanne Benjemin,staring Fabianne Therese (Sadi), Hannah Marks (Ava), Nathalie Love ( Kim) Susan Burke and Davey Johnson (as the couple) Annesa Ramsey and Dana Gould (as the Kensingtons). The Accident, written by David Bruckner,directed by David Bruckner,starring Mathew Zickel (Lucas). Jailbreak written by Dallas Hallam and Patrick Horvath, directed by Patrick Horvath,starring Maria Olsen (Sandy), David Yow (Danny),Matt Peters (Al), Tyler Tuione (Warren), Tipper Newton (Jessie). The Way In written by Matt Bettinelli-Olpin,directed by Radio Silence,Hassie Harrison (Jem), Kate Beaham (Cait),Gerard Downey (Daryl), Chad Villella (Mitch), Matt Bettinelli-Olpin (Jack). 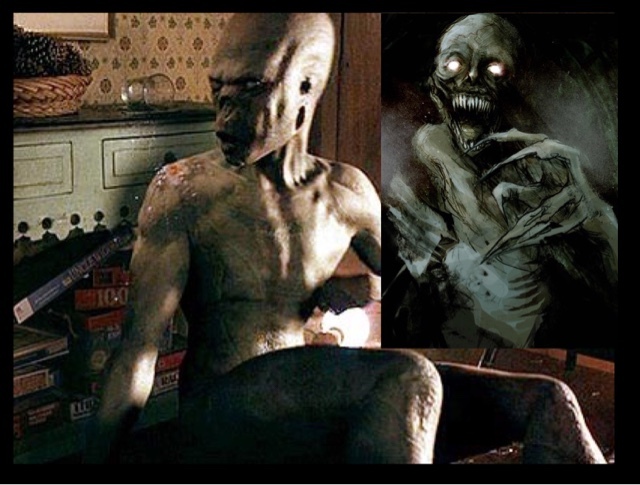 This film does have other great movie references in such as Carnival Of Souls,directed by Jack Harvey,and In The Mouth Of Madness by John Carpenter,with an overbearing feeling of every road does Infact lead south,and all stories are interlinked by an ever ending loop,a hellish journey that no one can escape from. We do have some great gore scenes,especially in the segment The Accident,and a fantastic head shot scene In Jailbreak. Is this film particularly scary,well no I didn't think so,but the cleverness of each script intertwining into each other is what makes this anthology so different from all the others, a very clever film that unlike most films I watch,actually really do want to watch this one again,as I feel it will definitely get better with every viewing. 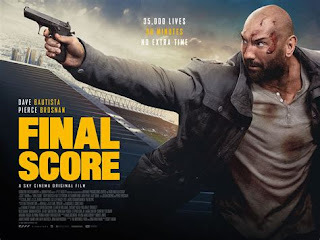 A masterclass in filmmaking from all involved in this project, in one word amazing.